Thanks to ever-present electronics, you are exposed to an increasing level of harmful blue light on a daily basis. Computer monitors, laptops, tablets, smart phones, LED TVs — even compact fluorescent (CFL) bulbs emit it. Cumulative exposure to blue light can suppress melatonin and disrupt your natural sleep cycle. 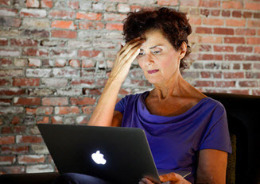 It may also lead to eye strain, headaches, blurred vision and macular damage, the leading cause of blindness. You know the pose: hunched over a smart phone, e-reader, tablet or game console. 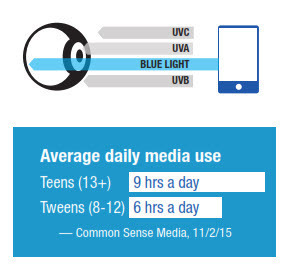 Children tend to hold devices closer and their larger pupils let in more blue light. This may put them at higher risk for developing sleep disorders, behavioral problems (such as ADHD), obesity and vision loss. The good news is that you don’t have to eliminate their devices — excellent, affordable protection is here. It’s vital to protect yourself against blue light now to preserve your vision long term. 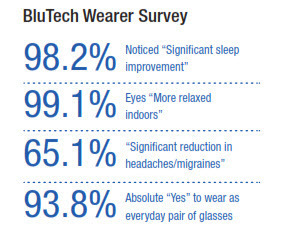 Trusted since 2010, BluTech Lenses feature Blue Light Plus™ offering the most complete near-clear protection against blue light available. No other clear lens filters more of the blue light known to be associated with digital eyestrain, glare, macular cellular damage and sleep cycle disruption without distorting color.